Siemens P Model AC coil kit includes a dual voltage coil, which is rated at 208-Volts at 60-Hz. 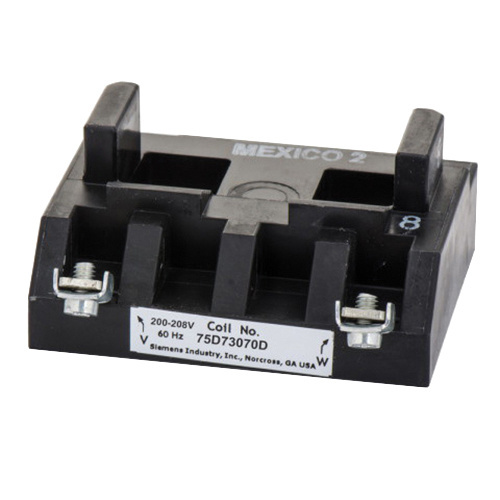 The snap-in mountable NEMA 00 - 2-1/2 sized coil has pull-in voltage rating of 510 VA and drop out rating of 51 VA. Kit is great for class 14, 17, 18, 22, 25, 26, 30, 32, 36, 37, 40, 43, 83, 84, 87, 88 starter and contactor used on 1-phase and polyphase motors. Kit is cUL listed and CSA certified.